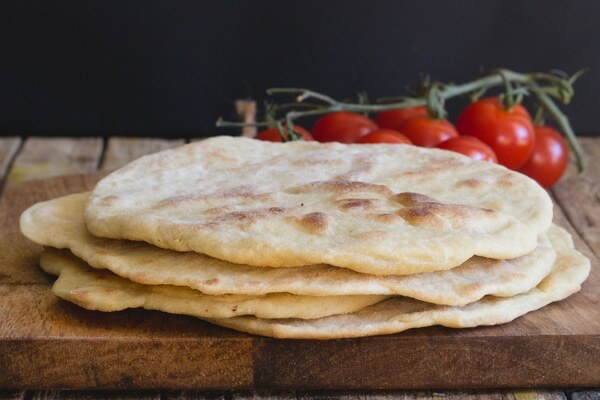 La Piadina Italian Flatbread, is a yeast free soft dough made on the stove top. The perfect wrap for all of your favourite fillings. Fast, Easy and so Tasty. I have wanted to make this flatbread forever. It is a recurring dish in our house. Whether for Lunch or Dinner sometimes a good warm and cheesy melting sandwich is the best way to go. My youngest daughter is actually the expert in the Flat Bread Dough Department on this one. She can make these with her eyes closed! Her sister called her up a while back asking her for the ingredients and the measurements because, well “no one can make it like Vanessa” and she really wanted one! Naturally her response was “well I don’t know, I just add the stuff until it looks right”. 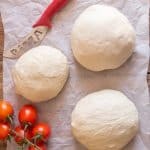 What are the Ingredients for a Piadina? The other day after I picked her up from school we decided to do a little window shopping, well to be honest, I do the window shopping and she does the shopping. We also decided to stop for a quick lunch. After skipping McDonald’s and Burger King she decided on a Piadina. By the looks of it I have to admit she made the right decision. Her Italian Flatbread Sandwich was filled with sliced tomatoes, tuna, melted Mozzarella and a little mayonnaise. It looked absolutely amazing. And yes it was delicious, she actually gave me a piece! 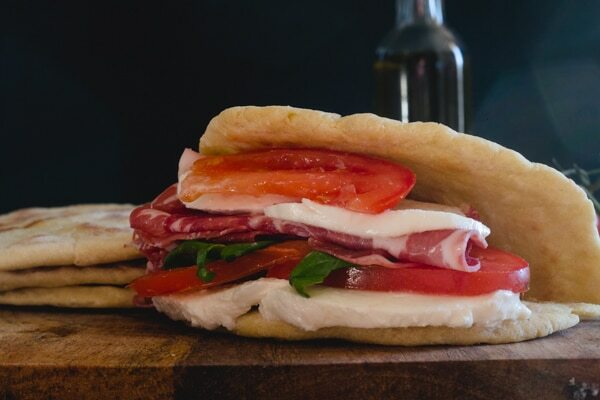 Italians love to fill flat bread with, sliced tomatoes, fresh mozzarella and mayonnaise, or sliced tomatoes, tuna and mayonnaise, or how about your favourite cold meat (prosciutto, salami and cheese). Or just your favourite fillings, so you decide. 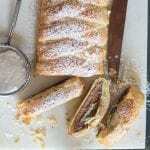 And don’t let a savory filling stop you, Italians are known to fill them with Nutella or Jam also. 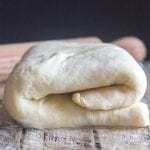 Just like my recent Ciambella Ramagnola, La Piadina is also from the Emilia-Romagna Region. I decided to ask her who’s flat bread was better, hers or theirs, of course it was hers. I was then determined to stand by her side to watch and learn. So do you know what I say when you have a craving for a warm, melty sandwich? 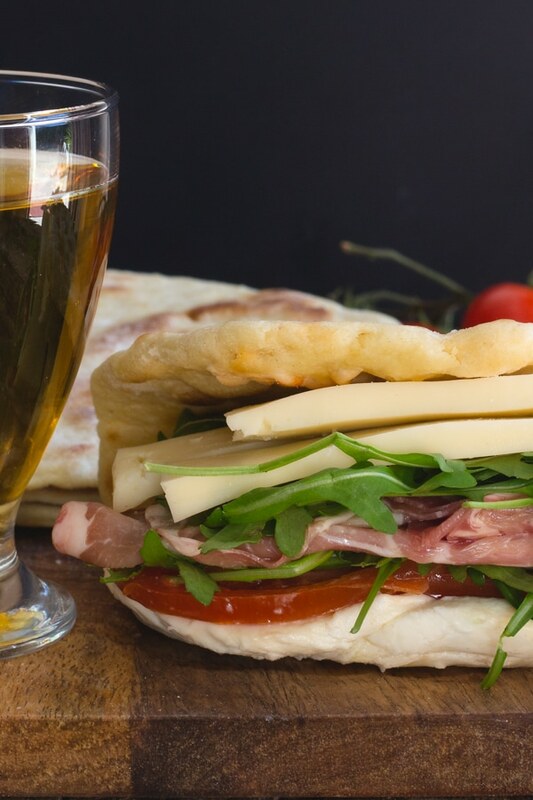 “Ditch the bread and make a tasty Piadina Italian Flatbread Sandwich. Buon Appetito! 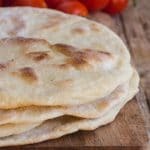 La Piadina - Italian Flatbread Sandwich, Breakfast, lunch or dinner, fast, easy & no yeast recipe. Fill it anyway. 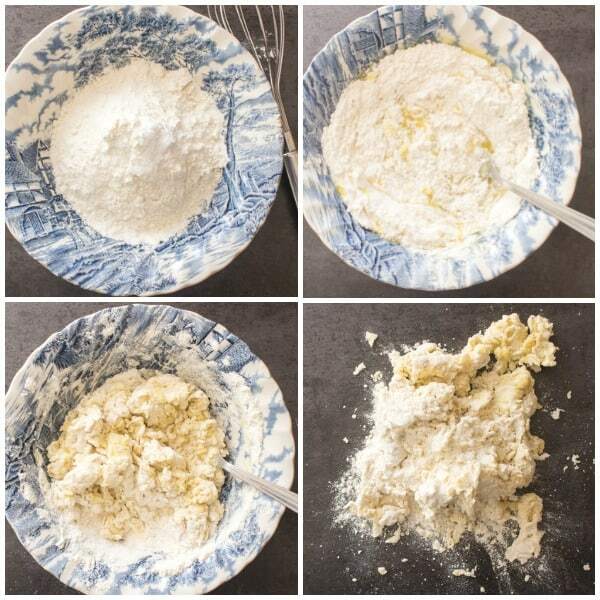 In a medium bowl whisk together flour, salt and baking soda, make a well in the middle and add the lard or olive oil, mix with a fork, then slowly add the milk and mix. 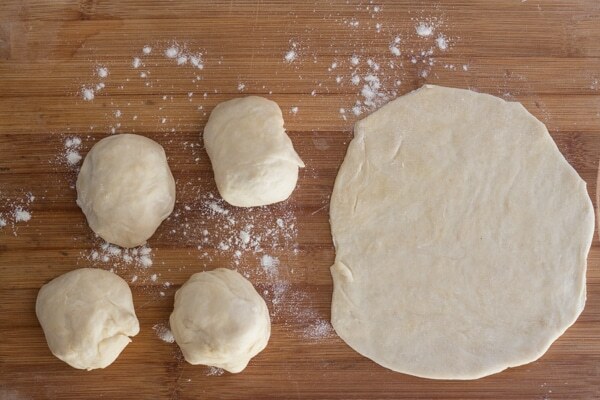 When almost combined move to a flat surface and knead into a smooth ball. Place in a lightly oiled bowl, cover with plastic and let rest 20 minutes. 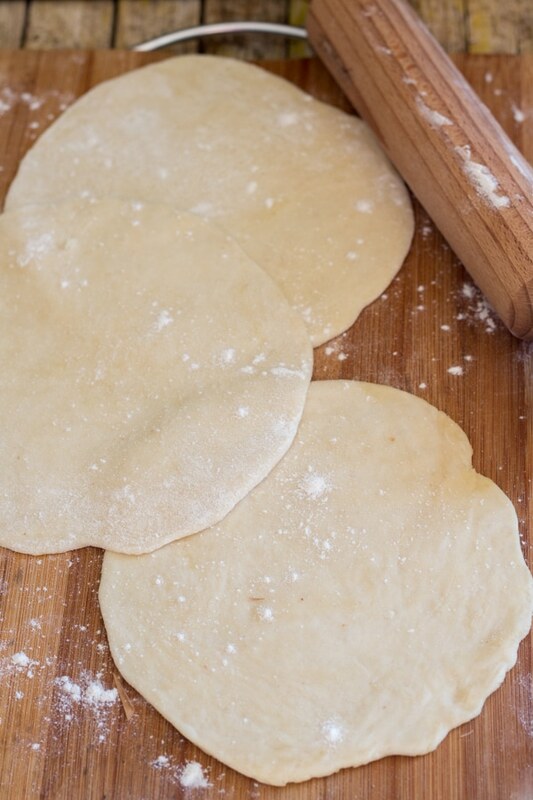 Divide dough into 3-4 balls, sprinkle a wooden board or flat surface with a little flour and place balls on top, cover with a tea towel and let rest 20 minutes. Roll out each ball to approximately 8-10 inches (20-25 cm)and very thin, almost paper thin. Prick the dough with a fork. Brush bottom of medium size frying pan with a little olive oil, when hot place one Piadina at a time on pan flip when golden, flip each side two times. 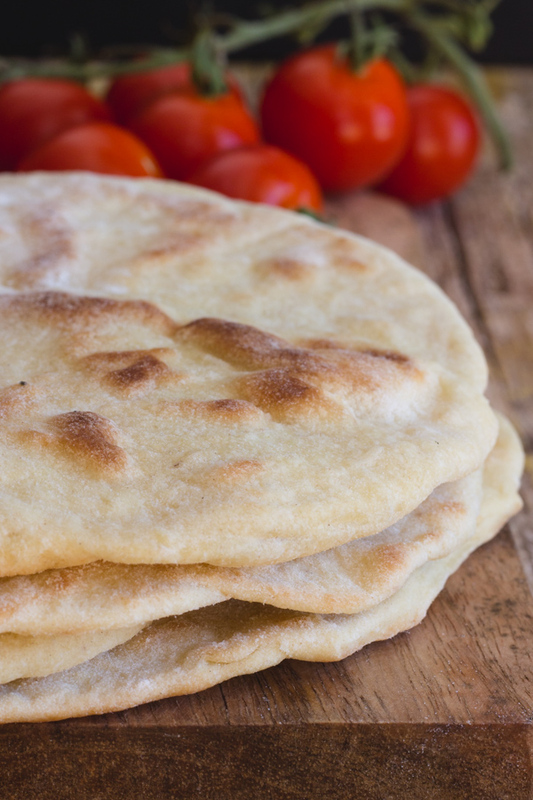 Immediately fill cooked warm flat breads with desired fillings. Eat warm. Enjoy! ** Recipe can be doubled. Updated from February 21, 2017. Hi Denise, she uses olive oil, actually lard is pig fat so if you don’t have lard (not crisco) than I would advise you to use olive oil. Hope that helps. 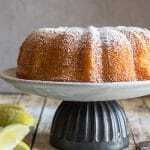 Can white wheat be used? Hi Patty, I have never used this flour before, although it sounds interesting and yes apparently you can, let me know how it turns out. Oh I love me some flatbread sandwiches! This one looks so simple and delicious with the melted mozzarella. I have to confess I am definitely the one who does the watching when it comes to breads and pastries, these look awesome, love the sound of that filling too! Hi Brian, you should try it, not difficult at all. Happy Sunday. This looks amazing, I love flat bread.